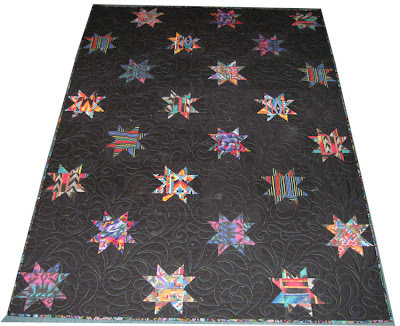 During my weekend, I was able to finish up the Western Stars quilt by sewing on the bold binding. I love it. It adds just the right amount of color. 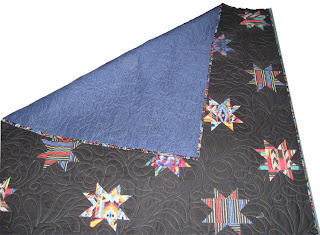 I liked the fabric so much, I went back to Joann's and bought more for any future black fabric quilts. 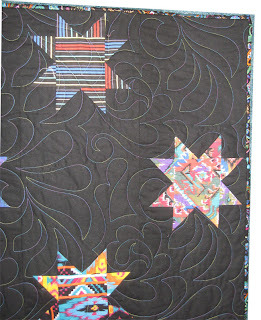 I love black with bright colors in a quilt so I'm sure I'll use for it in future as well. I also have learned to love sewing down the binding. It really goes fast when watching TV. Here are photos of the finished quilt and the backing. As always you can click on the photos for larger views.